What is the marching season in Northern Ireland? Why are these events steeped in history so disputed? What are the Orange marches? Northern Ireland's marching season is one of the fixed elements of Northern Ireland life - and in recent years it has become one of the most disputed. 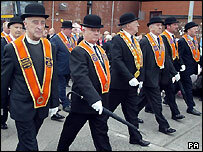 In short, the marching season sees members of "loyal orders" - predominantly the Orange Order - parade in ceremonial garb. The Order says it's a celebration of the Protestant culture and communities of Northern Ireland. Many nationalists, however, see it in a different light. In areas where the Order tries to march through Catholic areas, people see the parades as intimidatory and designed to raise tensions. The marching season is steeped in ritual and history - and in any other part of the world it might just pass off as a pseudo-religious festival enjoyed by all. But thanks to the divisions in Northern Ireland many regard the Orange marches as a sign of sectarianism. Is it just loyalist organisations who march? About 5% of parades are nationalist, a number of them associated with republicanism, such as commemoration events in areas with historically high support for the IRA. But generally speaking about three quarters of Northern Ireland's parades, including civic events and so on, are loyalist marches. We have to start with the history. In 1690, Protestant William of Orange (hence the name) defeated Catholic King James II at the Battle of the Boyne. About 100 years later, the Orange Order was founded in County Armagh by men who saw themselves in the vanguard of defending the Protestant faith. Orangemen regard this concept of defending the community's identity as being at the heart of their organisation. The height of the annual marching season comes on 12 July. Have they always been so controversial? Many Orangemen argue that for years their Catholic neighbours had no objection to the annual parading. But many nationalists say this is not so - and that it's only recently that they have had the power to challenge marching regarded as offensive. Many members of the loyal orders in turn believe that the opposition has largely been organised or whipped up by republican leaders. The symbols of the marches, such as effigies of William or James, depict historic events - whether or not you are offended by this comes down to what you believe those symbols to portray. Some Catholics say the marches and these symbols were used for years as a means to publicly "keep down" their community as second-class citizens. But many Protestants, whether or not they support the Orange Order, regard the marches as a part of Northern Ireland culture. For instance, many local Orange lodges commemorate the loss of thousands of Northern Ireland men at the Battle of the Somme in 1916. Those deaths have an important place in Protestant Northern Ireland culture. Is the marching season always a source of dispute? Many marches go ahead without any objection. But where the Orangemen try to parade in strongly nationalist areas, tensions can become raised between the two traditions. One of the most hotly disputed has been the annual Drumcree march at Portadown. For years it passed through open countryside to a small church. In the 1960s, a new estate, predominantly housing local Catholic people, was built on the march's return route. That march became one of the flashpoints of the last decade as the nationalist community came to oppose the route. The confrontations over this march put parades at the centre of the political agenda because they were a symbol of the tensions between the two communities. How have these disputes been resolved? The last Orange parade to go down the disputed Drumcree route was in 1997. Arguments over the political handling of Drumcree - and the widespread violence that came with it - led the government to establish an independent Parades Commission to adjudicate routes. Up to the end of 2003, about 6% of parades were deemed contentious and many disputes resulted in re-routing or other measures which the Parades Commission regarded as necessary to prevent tension. In reality, there has been enormous opposition to the Commission within the Orange Order and its political supporters, many of whom regard the body as failing to recognise the rights of Protestant people. What impact does this have on the peace process? One of the real fears is that Protestant communities are increasingly angry over what they regard as concessions to nationalist communities, while believing their own identity and culture is being eroded. They also feel that the way the Parades Commission works means that where nationalist communities threaten large scale disruption, the commission has little choice but to impose restrictions on Orange marches. In turn, this seems to play a part in wider frustration on the streets. The events surrounding the Whiterock Parade dispute showed that loyalist paramilitaries were willing to organise people to come onto the streets in a violent show of force. At the same time, the claim that a culture is being eroded is hardly new - it was indeed the fear behind the founding of the Orange Order in the first place. But there is a sense among much of the Unionist community as a whole - and Orangemen in particular - that the peace process has demanded huge sacrifices by them, with precious little in return.